We Bought A House on Wheels! 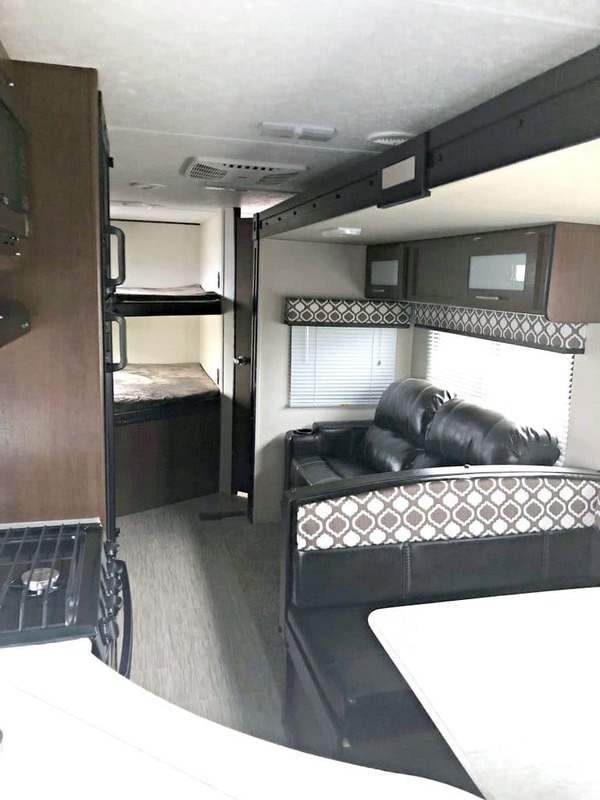 A Walkthrough of the 2018 Avenger ATI 27DBS Camping Trailer. We had a pretty rough spring break this year. We intended on going camping in our 20 year old camping trailer to Glenwood Springs, Colorado and instead we ended up in a hotel with so much vomit that I was ready to ditch every item we brought with us and charter a plane home. We ended spring break on a high note by finally purchasing a brand new camping trailer that we had put on our vision board last year. 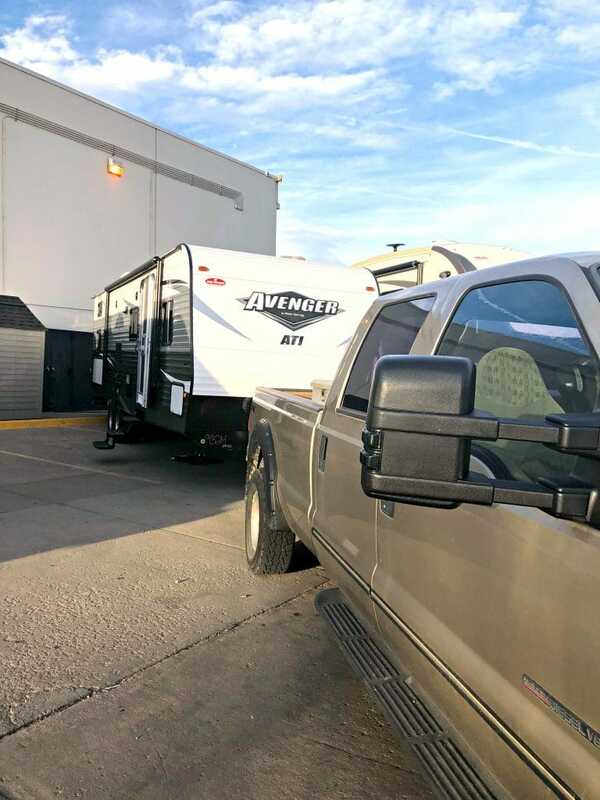 I figured it was time to share a quick walkthrough of the 2018 Avenger ATI 27DBS camping trailer we purchased! 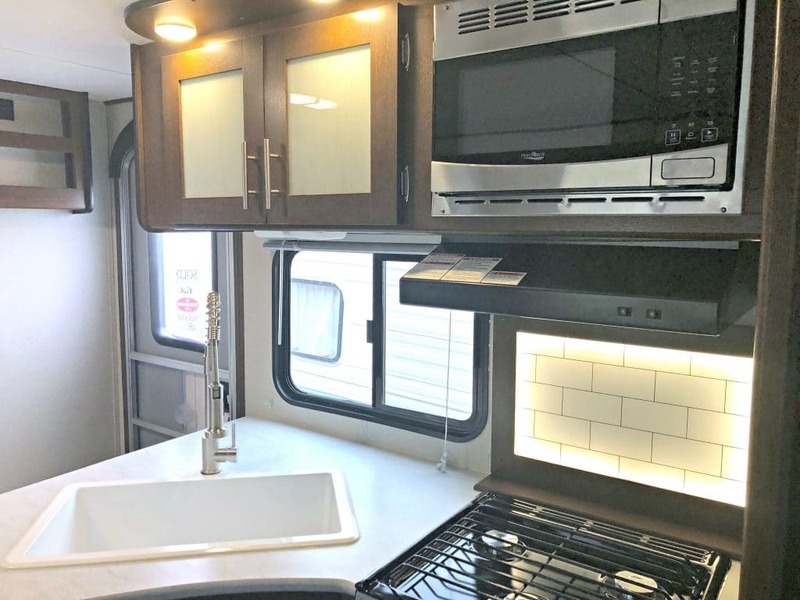 Let me just say that we got a smokin’ deal on this amazing camper. We were not about to pay the $35,000 price tag these typically come with. That would be a big fat nope. After getting into our old camping trailer and realizing that it was going to take at least a days worth of work to make the old gal ready for a nice weekend away, we were over it and decided that if we found a deal, we would go for it. Well we did. 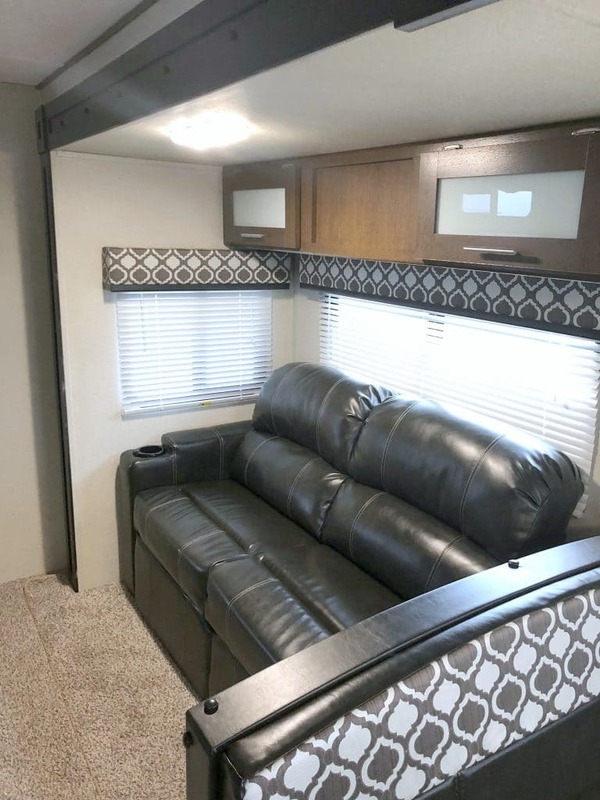 This pretty 2018 Avenger ATI 27DBS fit right into our budget and is a perfect fit for our family. The 2018 Avenger ATI 27DBS is 33 foot from hitch to end bumper. It has one slide out and is fully motorized. It sleeps up to 9 with a bunk area, a master bedroom and both the dining area and couch converting to beds if needed. 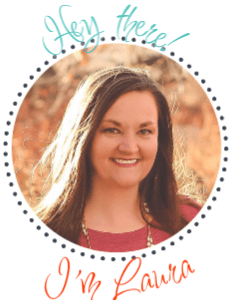 For our family it is the perfect size and what excites me the most is that the kids will have their own bunk spaces, so I will not spend time each day converting couches and tables into beds. It also has an outdoor kitchen area with a fridge, sink and cook top which my husband thinks is the coolest thing. The photo above shows the camper with the slide out collapsed for travel. When the slide out is moved out there is SO much room to move about and it really opens up the space. 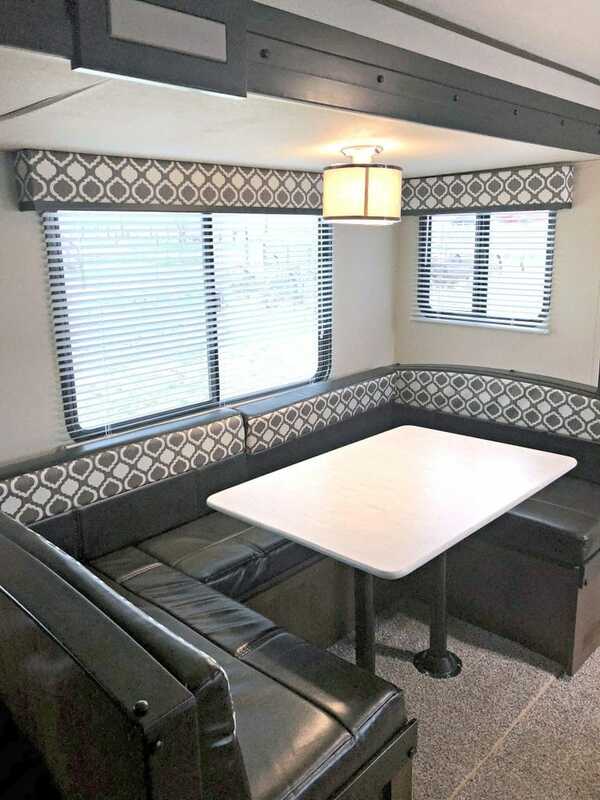 We fell in love with the interior design and patterns in this camper. It is also all easy to clean materials which is a dream for this mama that is a bit too obsessive with cleanliness. The dining area and the couch are both part of the slide out. The dining area has storage under each cushion and collapses into a bed if needed. There is carpet under the table, which is one of the only things I do not love about it, but otherwise it is a dream area for our family to really enjoy a nice meal together. Next to the dining area is the couch/entertainment area. The couch also folds down into a bed. One of the coolest features of this area is that the cup holders actually have USB plugs for charging AND have LED lighting in the cup holder. Perfect for hanging out in the dark with an ice cold beverage. The couch is facing something that I could live without while camping. Yup, that would be a ridiculous 50 inch flat screen. Honestly, my personal opinion is that we could have so much more storage space. My kids opinion is that it is the best thing ever. I see this being used very minimally. It does have an indoor and outdoor speaker system with CD/DVD capabilities, however, we will be ATVing, fishing, hiking and enjoying the actual outdoors like you should. I mean I get that I am going “glamping” but I also need to unplug a bit too and so do our kids. The bunk beds are cozy little spaces for our kids to make their own. I plan on making little curtains for them to pull shut and possibly building a little shelf area in there for them to keep books, cards, a flashlight and other little things that every good camper needs. The one thing the camper does not come with is a ladder to reach that top bunk, not going to lie, we were pretty bummed about this, however, we are building one that will be easy to store and sturdy for years to come. The kitchen might be my most favorite area. I am literally dying to cook. In my other camper, our oven was a hot mess and I never used it. Not that I plan on baking a cake or anything but I am pretty excited just to cook and clean in something that was never used by another person. I have NEVER had a new car, camper or house and this is a big deal for me. The kitchen has a deep sink, plenty of storage, an oven and cook top with a fan as well as a fridge and microwave. The backsplash is LED and lights up as you see in the photo. It is pretty much a dream! 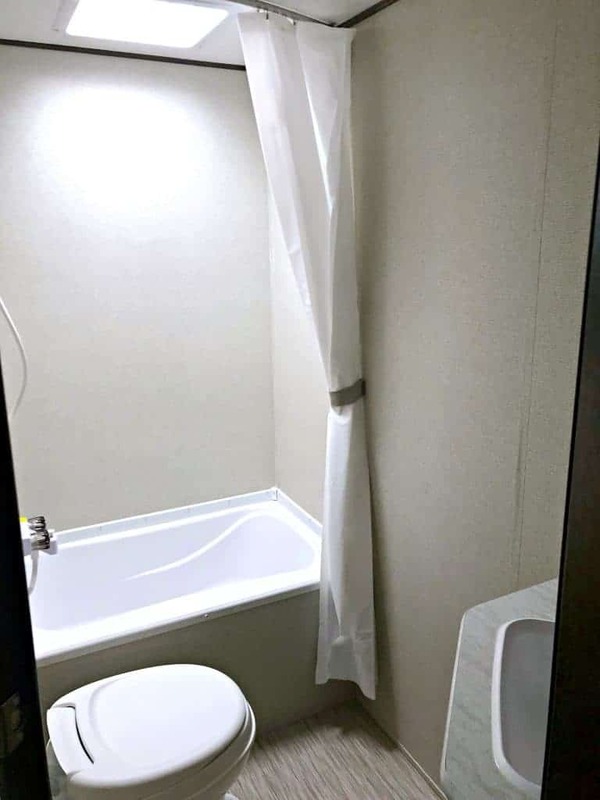 The bathroom is pretty basic for a camping trailer. It does have a deeper tub which I really wanted. We do a lot of ATVing and my kids get filthy, so having a tub that I can wash these little people off in with the moveable shower head is ideal. We were warned that we need to seal the bathroom area so that is also on our to-do list. Apparently the bathroom area can easily mold in these so the sealant is critical. Glad our dealer told us about that before we purchased. 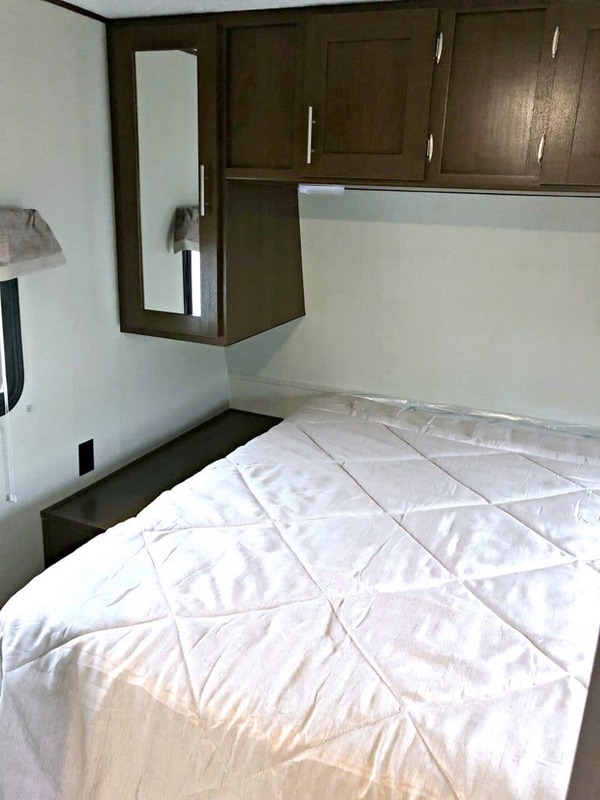 The master bedroom is its own room at the front of the camper. It has a pretty firm queen mattress with mock nightstands on each side and storage on the side and above the bed. 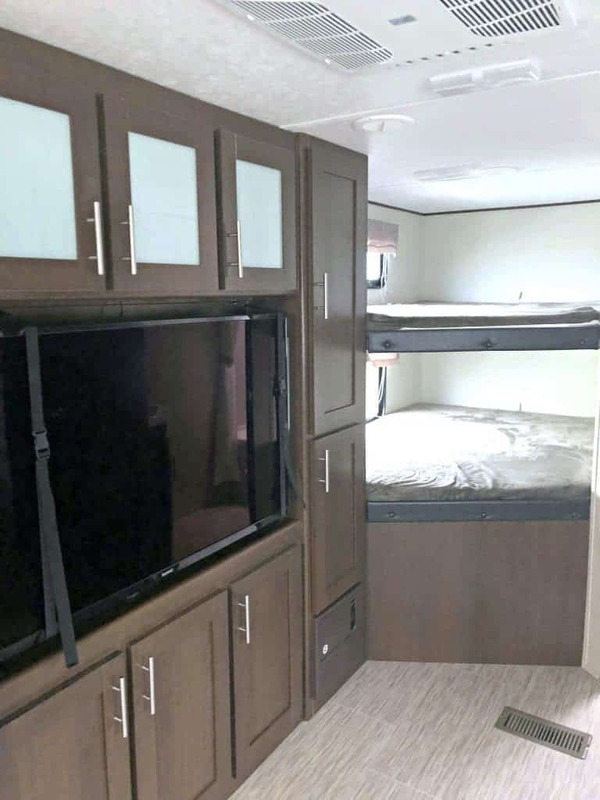 It has wiring for cable and a mounting space for a tv as well as 2 windows in the room. Overall, this camper fits all our needs and I honestly cannot wait to pack it up and take it out! As with anything that you purchase brand new, we fully expect to break things, to get it nice and dirty and to have a steep learning curve. We purchased a serious warranty with this pretty gal and are hoping that we won’t have to use it, but we are prepared to if needed. We are already planning for our first trip at the end of May and are so ready to see how comfy and amazing this space is for us. Love the glamper! That’s my idea of camping as well. Congrats! Thank you! My parents use to make us rough it, so those years are behind me! Ready for some luxury glamping!